The jump from Collegiate to Professional football is the greatest transition a football player makes in his lifetime. This profound leap is multifactorial, in that there are many layers that determine a players’ ultimate success at the highest level of competition . It is this study of these specific factors that we as fans are so very interested in. I would like to offer a brief glimpse into several categorical layers that may lead to the successful development of NFL Quarterbacks, and in particular Bills’ 1st round pick, Josh Allen. The game is faster than you can imagine. Quarterbacks have to process vast amounts of information, make decisions and then physically deliver the football with pin point accuracy, velocity and most importantly, with consistency. That is the job from the physical standpoint. I would argue that height is helpful, but there is proof in smaller players like Drew Brees, Russell Wilson, Michael Vick and yes, Tyrod Taylor, that size is not essential to NFL success. But it sure looks better on the draft board! Size does create the framework for strength and is therefore advantageous; just ask Big Ben, Eli Manning, Tom Brady, Joe Flacco, or Philip Rivers to name a few. These are big, physical men, and that does help with vision at the line of scrimmage, and with the pounding these players take on a weekly basis. 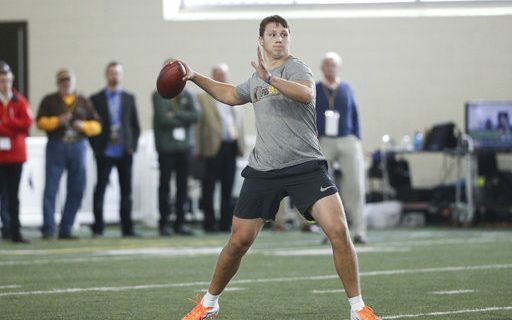 They possess the leg, torso, and upper body power to make all of the throws consistently with great velocity. I would also add that this feature of size and strength contributes to durability, which is essential for playoff success in the NFL. The physical foundation of every quarterback is a tripod: footwork, throwing technique and ball handling. Physical size, speed, quickness and agility matter a great deal to the players in terms of their drop-backs, shuffling, mobility and overall effectiveness. These measurable attributes can be seen and demonstrated on the field in real time, giving indications that an athlete can ultimately perform at the necessary level. Ultimately, physical size is not essential, but it is highly recommended for NFL Caliber success. The information processing qualities of quarterbacks are certainly more important than the “physical”, at least in my opinion. My experiences with Peyton Manning, Vinnie Testaverde, Chad Pennington, Kerry Collins and a host of other players have cultivated this belief. Mentally, if you are not prepared, if you don’t know what is happening with protections, hot reads, sight adjustments, run checks, personnel groupings; if you can’t function under the pressure and time constraints of the defensive ferocity, then it doesn’t matter how far you can throw it, you have no chance. The volume of information is overwhelming. Imagine standing in front of a fire hose, putting the nozzle up to your face and opening the valve. That is how it feels. It is impossible to get all of the information into your mouth and down your throat for digestion. You will get some, but no where near all of it. And this is why it takes time. How much time depends on other characteristics like intelligence, film study, working on the right things, experience with similar concepts, and the level of intrinsic competitive greatness the player possesses. Most fans can not imagine the amount of time and effort that is spent in Professional Football preparing for the next opponent. Coaches are busy grading players, studying the schemes, assembling strategies, formations, plays that may attack weaknesses. Players are busy healing from battle, taking care of their bodies, watching their own performances, and studying the players and structures they are going to face in the coming week. Administrators are there planning contingency scenarios, cap implications, player workouts, and overall management of the organization. These are around the clock endeavors on each platform, each working to produce positive outcomes. The quarterback himself plays an important role in his own development. The hunger, the diligence in preparation is essential to success. Tom Brady had his long time mentor Tom Martinez to lean on for specific technique training that has honed his skills to become perhaps the greatest of all time. Martinez was a personal confidant, a trusted resource that Brady used to perfect himself, doing so completely outside of the organization. Amazing! The bottom line is that some players care deeply about greatness and some do not. That is why Peyton Manning and Ryan Leaf to the naked eye looked close in terms of draft-ability, but to Bill Polian, Peyton Manning was miles ahead. It wasn’t a difficult decision to draft Manning over Leaf because of the research and knowledge of Peyton’s hunger and drive to prepare. Mentally, Peyton was head and shoulders beyond Leaf, and history proves Polian was correct. The hunger to absorb and master the craft has to be insatiable. Players experience unprecedented exposure to the media, fans and social platforms. In one moment they win the lottery and become millionaires. There is great expectation to produce results and often times that means facing failure on the National stage. These are difficult prospects for young men. Let’s be realistic here, I’m not suggesting that we feel sorry for them. I’m looking at reasons why players don’t achieve their potential. Take for example JaMarcus Russell, Ryan Leaf, J.P. Losman or E.J.Manuel. What affected their growth, belief and overall productivity? It is the ability to deal with failure that makes the most emotional difference. Being resilient and unwavering in the face of adversity is critical to a players’ development. I found this out first hand at the Naval Academy where every day is packed with failure as a Plebe. Either you can’t remember the menu for evening meal or you didn’t recite the specs of a Nimitz Class Aircraft Carrier; there were always expectations you couldn’t meet when you were asked, and you had to learn to deal with the failure. You have to accept your not perfect, that you failed in your assignment, then pick yourself up, dust yourself off and get back to work. But if you’re Big Man on Campus, All American, Mel Kiper’s first pick, failure is not in your vocabulary. I saw first hand Peyton Manning struggle as a rookie in training camp. Archie, his father came to a few practices to be there on the sidelines. It helped Peyton, it settled him. Not that he was truly doing poorly, he was great even on his worst day! Failure happens to everyone, even to the greatest players in history. The difference is not in failing, but what you do after you have failed. It is easy to shut it down for a while, to get away from the pain. But the greats don’t, they use the failure as fuel to drive them to work harder! To make improvements! They push through and never look back! Failure, poor performances and adversities can and do stunt players ability to grow and thrive into greatness. And this is where great coaches and mentors like Tom Moore, Tony Dungy and Bill Belichick make the most difference. They have the wisdom having seen it all before. They know how to bring these young men through their growing pains into a place where they can develop into their best selves. This organizational support and culture are also essential to developing players free from these kinds of emotional entanglements that can cripple focus and stunt growth. This cultural strength supports these young players. Successful organizations don’t throw their franchise players under the bus publicly! Good organizational support protects these young, imperfect and vulnerable quarterbacks from the wolves. An excellent example of this was Peyton Manning in his first seasons, going 3-13. Bill Polian didn’t blame it on Manning. Instead he surrounded him with the best coaches in the NFL, like Howard Mudd, Jim Caldwell, Tom Moore and Tony Dungy. He drafted great talent and gave Peyton the tools to succeed, with players like Marvin Harrison, Marcus Pollard and Edgerrin James. Emotional belief, confidence, maturity and the ability to deal with failure are essential. Each team has a system, terminology, a way of relating and communicating both in the huddle, at the line of scrimmage, and in some cases via signals. Some teams name formations with words, others with numbers. The route trees can be words, numbers or both. Protections are similar; in Indianapolis the Colts used words for protections, while with the Jets all protections were numbers, like 64, 72 etc. To grow anything, a team or a crop of corn, you will need the right seeds, optimal conditions for maturation, and an efficient way to harvest. If you have a tremendously bountiful crop but cannot get the crop to market, what do you really have? A great deal of waste. Players whose coordinators change frequently or who move around to different teams undergo the process of learning an entirely new language and way of thinking, and this stunts growth. Look at the greats, Jim Kelly, Brett Favre, Tom Brady, Dan Fouts, Joe Montana, Dan Marino, Peyton Manning and others. One consistent trend is that they played in a system for years. They grew, they blossomed and they learned how to build on and harvest the fruits that the consistency bore. Josh Allen is a big, physical and talented QB from Wyoming. He was junior college (Reedley College) transfer, a three sport athlete, having grown up on a farm in Fresno, CA. He didn’t have any collegiate offers out of high school, which was hard to believe, but continued to strive to compete at the next level. He was offered two scholarships after proving himself in junior college, eventually choosing Wyoming. We’ve heard this story before, the over looked player, like Tom Brady, Joe Montana, Carson Wentz, they found a way to develop their skills to become elite players. How did they do it? I would argue it’s the combination of size, strength, consistency, and operational decision making skills. Throw in a heavy dose of confidence as well. They found stability in their organization and grew within. Bill Walsh provided it for Montana. Belichick provided it for Brady, and the Eagles organization and Doug Peterson provide it for Wentz. The Buffalo Bills started heading in the right direction again when they hired Sean McDermott, who has since hired OC Brian Daboll. Daboll has arguably the most prolific exposure to coaching greatness that a coach could have. Bill Belichick and five Super Bowls, Nick Saban and a National Championship, but more importantly the depth of development of elite players. This experience will bode well for Josh Allen, because Daboll was there with Tom Brady and Jimmy Garoppolo in there development. He knows first hand what it takes, how it is done and will be the guide for Allen. But Allen has to do the work, he has to push beyond his current capabilities and beyond even what he thought was possible, particularly on the mental preparation side of things. Guys at this level have arrived with an amazing ability to throw the football. One would be flat out stupid to alter or try to change how they do it. What can be done however, and what I experienced first hand with the development of Vinny Testaverde, was to enhance the basic principles of “Above the Rim” Technique. Dan Henning, one of the great QB developers of our generation had a series of drills, designed to replicate where and how the ball travels in the NFL. We used garbage cans in reception areas, as well as a swing set apparatus to develop this “Above the Rim Technique” that greatly enhanced the accuracy, trajectory and overall performance, while minimizing the detrimental inconsistencies that comes from rotational motion. I believe that Brian Daboll will be the guide for Josh Allen, having experienced Brady working with wet footballs, or eating healthy, or preparing situationally like no on else. Daboll will instill and guide young Josh Allen to the next level of performance that the Buffalo Bills have been searching for. It will be the organizational stability, the player hunger to be the best, and the perseverance through failures that will lead the Bills to the harvest. Josh Allen has all the physical tools. He has been drafted into an up and coming organization that is focused on stability and growth. He has the right mentor and teacher in Brian Daboll. The rest is up to him. Does he possess the mental/emotional discipline and desire to take himself to the hallowed halls of elite greatness? Only he can answer this question. But, I believe he does. Jim Kubiak is a former professional football player and Naval Officer (USS Dwight D Eisenhower), as well as Navy’s All Time Leading Passer. 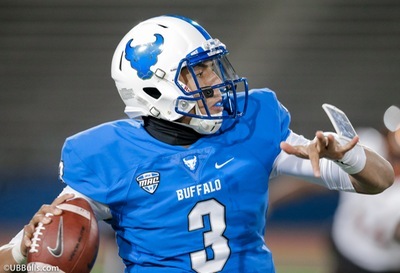 He is also the founder of the Western New York Quarterback Academy, and the former color analyst for the University at Buffalo Radio Network. Jim has extensive professional football experience in 5 NFL Training Camps (Panthers,Colts(3x),Jets), Practice Squad (NY Jets), NFL Europe (Barcelona Dragons, Amsterdam Admirals) and the Arena Football League (Buffalo Destroyers, Dallas Desperados, Georgia Force All Pro). His front office and coaching experience includes stints as the Director of Football Operations (Georgia Force) and Offensive Coordinator (Georgia Force, Philadelphia Soul).